The Houston Rockets are looking to get over the hump in the 2018-19 season and exact their revenge on the Golden State Warriors, who they lost to in last season’s Western Conference finals. To do that, it seems they may have their eyes on adding not one, but two current members of the Miami Heat. 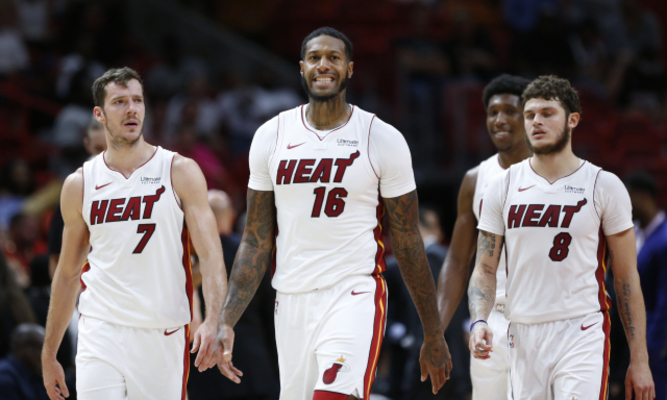 Those two players are reportedly James Johnson and Tyler Johnson. The report came on Tuesday afternoon, shortly after it was announced that the Rockets and Carmelo Anthony are expected to finalize a deal later this week. Interestingly, both Ryan Anderson and Tyler Johnson are viewed as players with fairly unattractive contracts. Anderson, whose production and minutes dropped off significantly last season, still has two years and $41.6 million dollars left on his current contract. While the money is a lot to swallow, it is possible that he would enjoy a resurgence with added usage in Miami. Tyler Johnson, who also suffered a somewhat significant drop-off in production last season, still has two years and $38.4 million remaining on his current deal. Nevertheless, he is a young and talented player who could certainly add some tenacity to Houston’s current roster. As for James Johnson, he would quickly become a very valuable addition for the Rockets. His versatility on the offensive and defensive end would help the Rockets as they look to take control of the Western Conference in the upcoming season. It seems that this trade is still far from being finalized, or even proposed, but it is certainly something to keep an eye on.